Intel Reference Opcode Bytes, Cont. 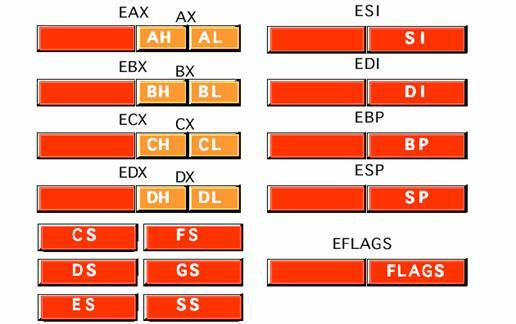 It is time to take a look that the actual machine instruction format of the x86 CPU family. They don't call the x86 CPU a Complex Instruction Set Computer (CISC) for nothing! Although the diagram seems to imply that instructions can be up to 16 bytes long, in actuality the x86 will not allow instructions greater than 15 bytes in length. 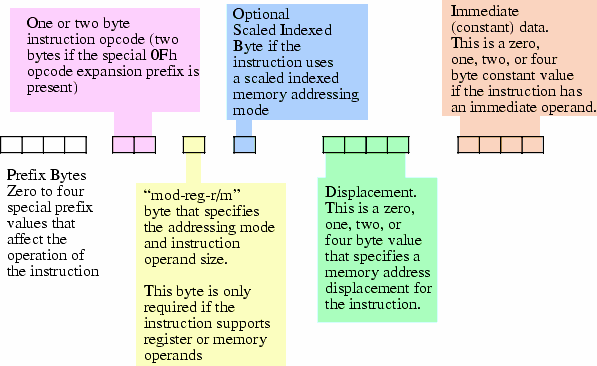 The prefix bytes are not the opcode expansion prefix discussed earlier - they are special bytes to modify the behavior of existing instructions. Brief Intel x86 instruction reference. two-byte opcode consisting of a 0Fh opcode expansion prefix byte. The second byte then specifies the actual instruction. The x86 opcode bytes are 8-bit equivalents of iii field that we discussed in simplified encoding. This provides for up to 512 different instruction classes, although the x86 does not yet use them all. If s = 0 then the operands are 8-bit registers and memory locations. Under 32-bit operating systems the default is 32-bit operands if s = 1. You'll soon see that this direction bit d creates a problem that results in one instruction have two different possible opcodes. If d = 0 then the destination operand is a memory location, e.g. If d = 1 then the destination operand is a register, e.g. the only operand in a single-operand instruction like NOT or NEG. (*) Technically, registers do not have an address, but we apply the term addressing mode to registers nonetheless. Depending on the instruction , this can be either the source or the destination operand. 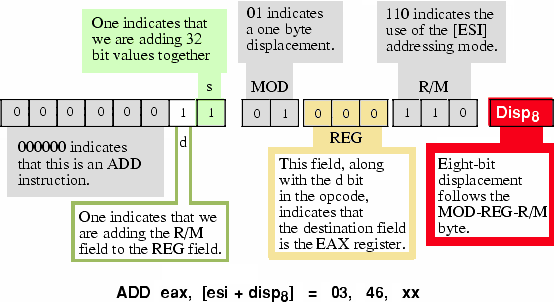 (*) For certain (often single-operand or immediate-operand) instructions, the REG field may contain an opcode extension rather than the register bits. The R/M field will specify the operand in such case. 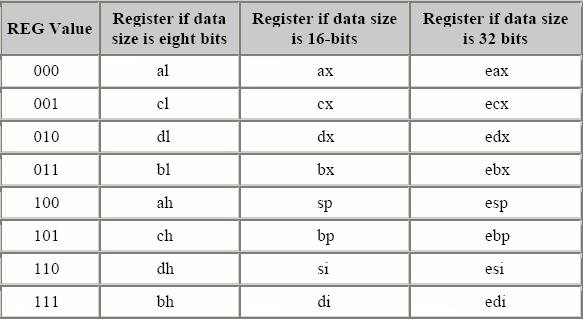 The size bit in the opcode specifies 8 or 32-bit register size. To select a 16-bit register requires a prefix byte. 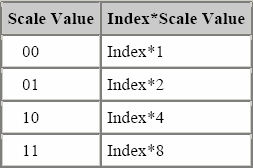 The so-called scaled indexed addressing modes, SIB = scaled index byte mode. 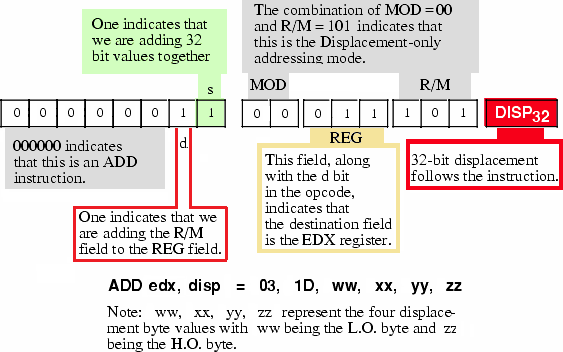 Scaled indexed addressing mode uses the second byte (namely, SIB byte) that follows the MOD-REG-R/M byte in the instruction format. 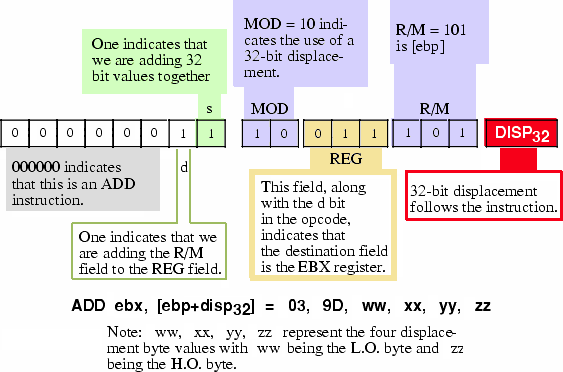 The MOD field still specifies the displacement size of zero, one, or four bytes. The MOD-REG-R/M and SIB bytes are complex, because Intel reused 16-bit addressing circuitry in the 32-bit mode, rather than simply abandoning the 16-bit format in the 32-bit mode. There are good hardware reasons for this, but the end result is a complex scheme for specifying addressing modes in the opcodes. Note: n = 1, 2, 4, or 8. 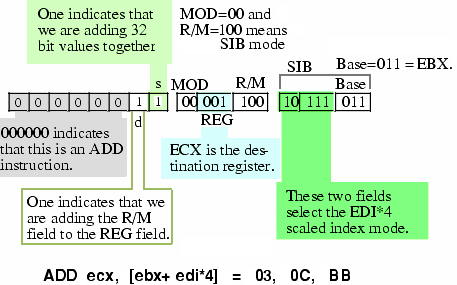 The Base and Index fields of the SIB byte select the base and index registers, respectively. 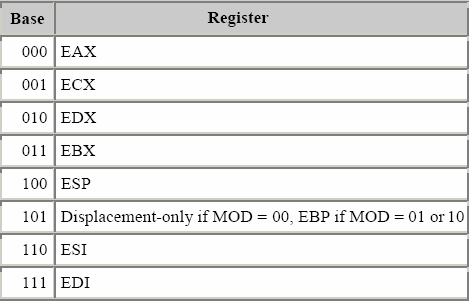 Note that this addressing mode does not allow the use of the ESP register as an index register. Presumably, Intel left this particular mode undefined to provide the ability to extend the addressing modes in a future version of the CPU. 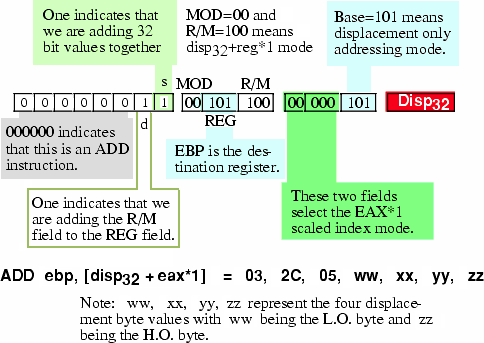 How could we encode various forms of the ADD instruction using different addressing modes? Interesting side effect of the direction bit and the MOD-REG-R/M byte organization: some instructions can have two different opcodes, and both are legal! could be 00 C1 (if d=0), or 02 C8, if d bit is set to 1. The possibility of opcode duality issue here applies to all instructions with two register operands. Note that we could also encode ADD ECX, EAX using the bytes 03 C8. MOD-REG-R/M and SIB bytes have no bit combinations to specify an immediate operand. Instead, x86 uses a entirely different instruction format to specify instruction with an immediate operand. If opcode high-order bit set to 1, then instruction has an immediate constant. : indeed, you cannot specify a constant as a destination operand! Therefore, destination operand is always the location encoded in the MOD-R/M bits of the the MOD-REG-R/M byte. For 8-bit operands, the CPU ignores x bit. If x bit contains zero, the Constant is the same size as the operand (i.e., 16 or 32 bits). If x bit contains one, the Constant is a signed 8-bit value, and the CPU sign-extends this value to the appropriate size before adding it to the operand. This little x trick often makes programs shorter, because adding small-value constants to 16 or 32 bit operands is very common. the instruction does not need to use the REG field to specify an operand. Instead, the x86 CPU uses these three bits as an opcode extension. For the ADD-immediate instruction the REG bits must contain zero. Other bit patterns would correspond to a different instruction. Note that when adding a constant to a memory location, the displacement (if any) immediately precedes the immediate (constant) value in the opcode sequence. When Intel designed the 8086, one bit in the opcode, s, selected between 8 and 16 bit integer operand sizes. three encodings were needed to support 8, 16, and 32 bit sizes. Solution was an operand size prefix byte. in a 32-bit environment, programs were more likely to use 8-bit and 32-bit operands far more often than 16-bit operands. So Intel decided to let the size bit s in the opcode select between 8- and 32-bit operands. 32-bit programs don't use 16-bit operands that often, but they do need them now and then. To allow for 16-bit operands, Intel added prefix a 32-bit mode instruction with the operand size prefix byte with value 66h. This prefix byte tells the CPU to operand on 16-bit data rather than 32-bit data. the assembler does this automatically as soon as 16-bit operand is found in the instruction. slower because of their effect on the instruction cache. x86 instruction can have up to 4 prefixes. REP repeats instruction the number of times specified by iteration count ECX. REPE and REPNE prefixes allow to terminate loop on the value of ZF CPU flag. Segment override prefix causes memory access to use specified segment instead of default segment designated for instruction operand. Operand override, 66h. Changes size of data expected by default mode of the instruction e.g. 16-bit to 32-bit and vice versa. Address override, 67h. Changes size of address expected by the instruction. 32-bit address could switch to 16-bit and vice versa. 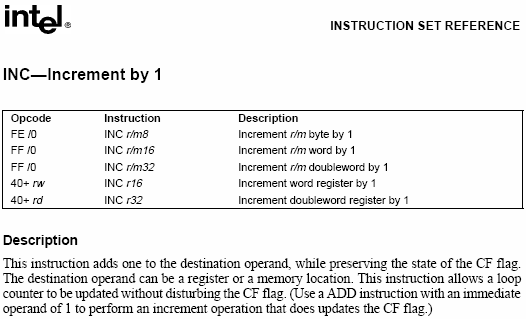 To shorten program code, Intel created alternate (shorter) encodings of some very commonly used instructions. These instructions are one byte shorter than their standard ADD immediate counterparts. requires an operand size prefix just as a standard ADD AX, constant instruction, yet is still one byte shorter than the corresponding standard version of ADD immediate. Any decent assembler will automatically choose the shortest possible instruction when translating program into machine code. Intel only provides alternate encodings only for the accumulator registers AL, AX, EAX. x86 opcodes are represented by one or two bytes. Opcode could extend into unused bits of MOD-REG-R/M byte. size of each operand, including the size of an immediate operand. It provides addressing mode information for one or two operands. MOD field (bits [7:6]), combined with the R/M field (bits [2:0]), specify memory/register operand, as well as its addressing mode. REG field (bits [5:3]) specifies another register operand in of the two-operand instruction. Instruction set architecture design that can stand the test of time is a true intellectual challenge. It takes several compromises between space and efficiency to assign opcodes and encode instruction formats. Today people are using Intel x86 instruction set for purposes never intended by original designers. Extending the CPU is a very difficult task. The instruction set can become extremely complex. If x86 CPU was designed from scratch today, it would have a totally different ISA! ...but they are very resistant to moving existing software from one platform to another. This is the primary reason the Intel x86 platform remains so popular to this day. Allowing for future expansion of the chip requires some undefined opcodes. Reduce the number of instructions in the initial instruction set? Increase the size of the opcode? Rely on an opcode prefix byte(s), which makes later added instructions longer? There are no easy answers to these challenges for CPU designers! CPU exceptions that may be generated. The instructions are arranged in alphabetical order. 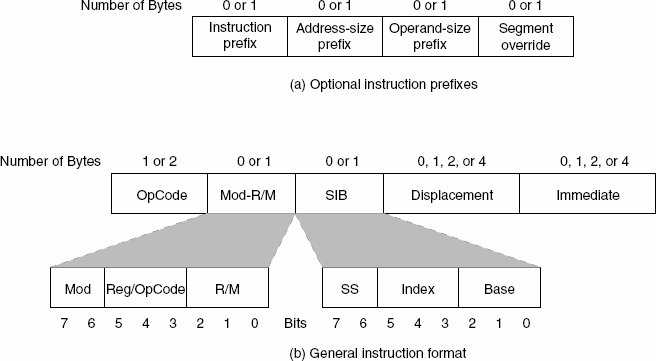 Appendix A provides opcode map for the entire Intel Architecture instruction set. Chapter 3 begins with instruction format example and explains the Opcode column encoding. The Opcode column gives the complete machine codes as it is understood by the CPU. When possible, the actual machine code bytes are given as exact hexadecimal bytes, in the same order in which they appear in memory. 34. Intel Reference Opcode Bytes, Cont. The reg field of Mod R/M byte contains the instruction opcode extension. 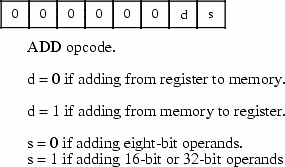 The size bit in the opcode specifies 8 or 32-bit register size. 35. Intel Reference Opcode Bytes, Cont. /r - Indicates that the instruction uses the Mod R/M byte of the instruction. an r/m (register or memory) operand. 36. Intel Reference Opcode Bytes, Cont. and possibly a new value for the code segment register CS. 37. Intel Reference Opcode Bytes, Cont. ib, iw, id - A 1-byte (ib), 2-byte (iw), or 4-byte (id) indicates presence of the immediate operand in the instruction. The opcode determines if the operand is a signed value. All words and doublewords are given with the low-order byte first (little endian). 38. Intel Reference Opcode Bytes, Cont. +rb, +rw, +rd - A register code, from 0 through 7, added to the hexadecimal byte given at the left of the plus sign to form a single opcode byte. The Instruction column gives the syntax of the instruction statement as it would appear in a 386 Assembly program.